I started working on Mistika this summer when Slik, one of my clients bought a Mistika station to replace their Avid DS station. I’ve been learning more and more every time I’ve have the chance to get my hand on the station. One thing I found that was missing to help me in my learning experience is was a shortcut list that would gather all the ready to use shortcuts in one handy document. On SGO’s forum, they suggest to open the keyboard shortcut config file in a text editor but I find this solution risky and hard to read. So I decided to edit my own Mistika shortcut list and share it with you. 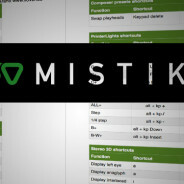 I’ve gathered the default shortcut on Mistika 8.2. There are many more shortcuts that you can customize by opening the shortcut config file but I’ve started with those. If I find that some important shortcuts are missing feel free to suggest some modification.